We see a little more of the Slyther at the start of The Waking Ally, but not for long as Ian bashes it with a rock and sends it plummeting to its death down the mineshaft. As it falls, it makes a rather pitiful cry. Am I the only one to have a tinge of regret at the Slyther’s passing? After spending the early episodes as exterminating baddies, the Daleks we see at the mines are slightly less exciting. They come across as a group of middle-managers, worrying about work parties and the like. It’s interesting that eight years later, in Day of the Daleks, they’re very similar. Had Day been written by Nation it would have been an obvious retread, but that one was scripted by Louis Marks. Possibly Marks had been influenced by these episodes or maybe he was just drawing on a similar theme. After all, you can only exterminate so many people – if you kill them all then you’ll have no labour force left to carry out your nefarious plans. Hartnell’s back and he’s in fine form – we see the Doctor give one of the Robomen a damn good thrashing. For those who believe the Doctor is a pacifist it might be somewhat unexpected, but in reality he’s never been averse to using force. It’s rarer that he actually gets physical (unless he’s being played by Jon Pertwee) but there’s countless occasions when the Doctor is shown to be quite happy to wipe out large numbers of whoever he considers to be the enemy that week. His death is so bleak. He finds his brother, but discovers that he’s been turned into a Roboman. Larry’s efforts to find some spark of humanity still remaining in his sibling (“Phil…it’s Larry, your brother Larry. Think Phil! Remember me! Angela…Your wife, Angela! I’ll take you to her”) comes to nothing and Robo Phil kills him. As Larry dies, so does Robo Phil and the final (unscripted) recognition of Larry by Robo Phil just before he draws his final breath simply adds another level of tragedy to this scene. How does the Doctor work out that the Daleks’ mine-works in Bedfordshire are the centre of their operations? For all we know there could be similar Dalek mines dotted all around the globe. The others ask the Doctor what the Daleks’ intention could be. He’s not sure, but the cat’s already been let out of the bag by Larry – his assertion that the Daleks are keen to extract the Earth’s core turns out to be 100% accurate. Perhaps it would have been better to snip this earlier line out, that way the mystery would have lasted a little longer. Later on, the Black Dalek helpfully explains exactly what their ultimate plan is via the intercom. “This is the Supreme Controller. Our mission to Earth is nearly completed. We were sent here to remove the core of this planet. Once the core is removed, we can replace it with a power system that will enable us to pilot the planet anywhere in the universe.” This is breathtakingly bonkers. 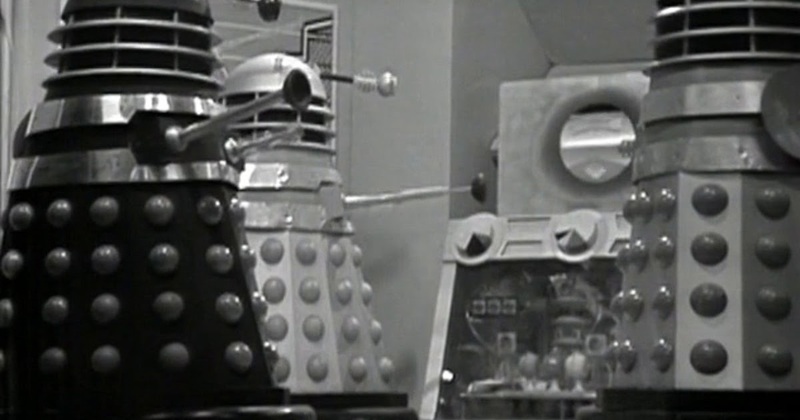 The scene with the Black Dalek is a good example of the chaos that can occur when you choose to pre-record Dalek dialogue. This didn’t happen that often – probably for the reasons you see here. Mid-way through the scene, the cues begin to go hopelessly out of sync which gives us a bizarre moment when three Daleks are all taking at once and making very little sense! As previously discussed, Hartnell wasn’t able to take part in the recording of this episode, so his handful of lines had to be farmed out. This occurs when David steps up to dismantle the Daleks’ firebomb (this would have been the Doctor’s only contribution to the episode). It’s presumably a sign of the times that no thought was given to the possibility of Susan becoming the bomb expert. It would have been a good reminder that whilst she looked like a fifteen-year old girl she possessed experience which belied her appearance. But no, it has to be the man who takes charge, while Susan hovers anxiously in the background. There’s a first in The End of Tomorrow – it’s the first time that Doctor Who filmed in a quarry (and this was one of those rare times when the location was actually shown to be a quarry and not an alien planet!) John’s Hole at Stone, Kent has this singular honour. And how well do the Daleks work in the quarry? Answer, not very well. We see one trundle a short distance rather slowly, but otherwise they wisely stay immobile. The unmistakable Nicholas Smith, sporting an unexpected Mummerset accent, pops up as Wells. He racked up numerous credits during the 1960’s but he’ll always be best remembered as Mr Rumbold from Are You Being Served? Terry Nation has often been accused of being little more than a hack writer, churning out formulaic scripts at great speed. His very brief original description of the Daleks is used as an example of this, but it’s fair to say that there were other times when he took more of an interest in detailing how his creations should be visualised. His description of the Robomen is a good case in point. Maybe one of the reasons why Nation didn’t spend too long on descriptive passages is that he knew his ideas might not be adopted. With the Robomen, some of his concepts were taken on board, but it’s notable that Nation didn’t specify that they should wear what appears to be wastepaper baskets on their heads. The movie managed something more sleeker, but the concept of miniaturisation doesn’t seem to have been considered here. With the Doctor unconscious, Susan and David are exploring the sewers. In Nation’s original draft, David mentions that people moved underground to avoid the plague. Their descendants are still there, but they’re no longer quite human. Having adapted to living in total darkness, their “hair is matted and shoulder length and, like the face, it is totally white. Only the eyes make black circles. They are larger than human eyes, bulging and dark like those of a night creature. Canine teeth project over the lower lip.” Instead we see Susan tangle with a friendly alligator. Oh well, it was cheaper I guess. We catch a brief glimpse of the Slyther. It’s the sort of thing that defies description and you have to be impressed at how seriously William Russell reacts to it. Later on there would have been the temptation to send it up (goodness knows what would have happened had Tom Baker met it – something along the lines of The Creature from the Pit no doubt) but Russell is rock solid. The bizarre sounds it makes are also memorable. There can be few odder cliffhangers than the sight of the Slyther advancing on Ian and Larry whilst it slowly waves a portion of itself. Richard Martin might not be Doctor Who’s most highly-rated director, but at least he wisely chose to keep this shot as a close-up. The relationship between Susan and David begins to deepen. In part this is due to their shared experiences – in this episode, the pair (in hiding) hear the Daleks exterminate a poor unfortunate. “You killed my wife and my brothers, now you want to kill me, argh, get away from me! No, no, no…argh!” Ford’s reaction sells the horror of the moment more powerfully than if we’d actually seen the man killed. Following this disturbing moment, Susan wishes that they could simply leave. SUSAN: If only we could go to the ship and get away from here. DAVID CAMPBELL: Well, I couldn’t go anyway. SUSAN: Oh, David, David! Perhaps you could! I…I..could ask Grandfather and I’m sure he’d let you come. Oh, we could go to place where they’d never even heard of Daleks. DAVID CAMPBELL: And what happens if there’s something unpleasant in the new place? SUSAN: We move on somewhere. DAVID CAMPBELL: No Susan, that’s not for me. DAVID CAMPBELL: Look, things aren’t made better by running away. SUSAN: Well its suicide to stay here. SUSAN: I never felt that there was any time or place that I belonged to. I’ve never had any real identity. The Doctor of S1 would have agreed with her and no doubt would have been just as keen to hot-foot it out of there, but Susan should know by now that the new, improved S2 Doctor is not going to leave until the Daleks are defeated. It’s also notable that in the last few episodes Susan has begun to express a little dissatisfaction with life aboard the TARDIS. This is something we’ll see repeated over the years and it usually happens just before a companion is due to leave. Anytime a companion starts to complain more than they normally do (another obvious example is Victoria in Fury from the Deep) you know they’re heading for the exit door. Day of Reckoning is notable for a major location sequence in which Barbara, Jenny and the doomed Dortmunn flee from the Daleks whilst passing as many well-known London locations as they can fit in. Accompanied by Francis Chagrin’s unusual percussion-based incidental music it’s an iconic few minutes – not least for the Daleks waving their suckers in a Nazi-salute style. Hartnell doesn’t have a great deal to do in this episode, which is just as well as he was injured during rehearsals (as he was being carried down the Dalek saucer’s ramp he was dropped on the floor). This could have been a lot more serious – Hartnell was temporarily paralyzed – but he recovered well enough to record the episode in the evening. But it was recommended that he spend a few subsequent days recovering in bed, so he was hastily written out of the following episode (although luckily he wasn’t a major figure in that one either). After the Doctor and Ian (and no doubt the audience) were surprised by the Dalek emerging from the Thames, they’re taken to the Dalek saucer at Chelsea. Another prisoner, Craddock (Michael Goldie) explains how the Daleks invaded. CRADDOCK: Well, the meteorites came first. The Earth was bombarded with them about…ten years ago. ‘Cosmic storm’ the scientists called it! Well, the meteorites stopped, everything settled down, and then … people began to die of this new kind of plague. CRADDOCK: Yeah, the Daleks were up in the sky just waiting for Earth to get weaker. Whole continents of people were wiped out. Asia, Africa, South America. They used to say the Earth had a smell of death about it. IAN: Why Craddock? What were the doctor’s and the scientists doing about it? CRADDOCK: Ah, well, they came up with some new kind of drug, but it was too late then. This scene intercuts with David Campbell (Peter Fraser) telling Susan and Barbara the same story. DAVID CAMPBELL: Well, the plague had split the world into tiny little communities. Too far apart to combine and fight and too small individually to stand any chance against invasion. DAVID CAMPBELL: Mmm. About six months after the meteorite fall, that’s when the saucers landed. Nation’s draft scripts gave a different version of events. In the late twentieth century, the world was at war – China, Russia and America were at loggerheads whilst Britain was in conflict with Europe. But the arrival of the Daleks meant that the world united to face this common threat and a world government was formed in Japan. The main problem with this scenario is that it would have begged the question as to exactly what the Daleks had been up to on Earth for the past two hundred years! When Nation started crafting a sequel to The Daleks, his first thought was about how he could raise the stakes. Showing the Daleks as the masters of Earth was an obvious choice – Jon Pertwee’s oft repeated comment about finding a Yeti using a public convenience in Tooting Bec demonstrates how mixing the everyday with the unknown can be a powerful one. The Dalek/Thal conflict on Skaro worked well, but juxtaposing the Daleks with the familiar Earth landscape offered many more dramatic possibilities. Of course you have to find a good reason as to why the Daleks would travel across the universe to invade the Earth. Did Nation succeed? Mmmm. Over the decades Earth would find itself under attack from a whole host of marauding aliens – but it’s rather fitting that the Daleks, given their status in the series, were the first. They’re also by far the most successful, since subsequent invasions almost always happen when the Doctor is around, meaning that he’s able to save the day before things get too far out of hand. Here, the invasion’s over and the Daleks have achieved a complete victory. Humanity has been decimated and the survivors have been reduced to living underground or on the run, waging a seemingly hopeless struggle against an all-powerful enemy. Susan and Barbara have made contact with the rebels. They’re all fairly broad character types, but luckily Richard Martin found good actors who were able to put a little meat on their bones. Dortmunn (Alan Judd) is the wheelchair bound inventor who’s convinced he’s developed a bomb to destroy the Daleks – we’ll shortly see how terribly wrong he is. Jenny (Ann Davies) is a hard as nails survivor who, no surprise, becomes more human as the serial develops. Tyler (Bernard Kay) doesn’t have a great deal to do in this episode, except argue with Dortmunn, but Kay (who would return to the several several times in the future) is always watchable. And David Campbell will serve a very definite purpose in the story, although there’s no sign of that yet. A late revision to the script concerned the intelligence test that the Daleks use to decide which humans are fit to be converted into Robomen. In the first draft, the Daleks simply turned up and took their prisoners to be Robotised one by one. This obviously wasn’t deemed to be satisfactory, so something more elaborate was created. But it does beg the question as to why the Daleks bother with all this palaver – since the Robomen are seen to have no free will of their own, why do the Daleks need to select those of a certain intelligence? This also means that a Dalek has to be present outside every cell, waiting for the prisoners to work out how to escape. Surely this would tie up a lot of Daleks? The Peter Cushing movie streamlined things considerably by showing Cushing’s Doctor using a comb to escape! Technically, this episode is a little messy. A member of the production team wanders in shot at one point and David Graham’s pre-recorded Dalek lines are cued in too early in one scene. The rebels’ attack on the saucer doesn’t really convince either – had it been shot on film rather than VT then it could have been cut together more convincingly. ​The Dalek Invasion of Earth was where everything changed. It’s the first time that an element from a previous story returned, so it can be said to be the beginning of Doctor Who continuity. Whether you call it “continuity” or “kisses to the past” or something else, it’s a dirty word for some people. Many considered 1980’s Doctor Who to be far too obsessed with its own past (and just to show that nothing changes, the modern series is the same for some people). Maybe one of the reasons why I love 1960’s Doctor Who is because it’s fairly light on continuity. There are returning monsters (Daleks, Cybermen, Yeti, Ice Warriors) but they’re the exceptions rather than the norm – a returning baddy was more of an event then, as it didn’t happen all the time. The Doctor’s place in the universe is another reason why I like 1960’s Who. He’s able to travel around in almost complete anonymity – compare this to the series from the 1970’s onwards, where he increasingly became someone that everyone in the universe seemed to know (and if they didn’t know him personally, they’d probably have heard of the Time Lords at least). The trend continues to this very day, and modern Who feels even more constricted than the original series ever did. True, we see a few examples of the Doctor’s fame during the Hartnell and Troughton eras (for example, there’s the frankly bizarre notion that the Doctor’s travels have been monitored in The Savages, making Jano and his friends the very first Doctor Who fans) but they’re rather an exception. Hartnell’s Doctor never arrives somewhere and announces that he’s a Time Lord, or the most powerful being in the universe, or the thing that monsters are afraid of, etc, etc. He has to gain people’s trust by his actions rather than simply relying on his reputation. Turning back to DIOE, Terry Nation had to do some frantic re-tooling in order to present the Daleks as a galactic force. In The Daleks they seemed to have no ambition for conquest – they merely wanted to survive. Later in this story we see the Doctor blithly tell Ian that the Daleks they encounter on Earth come from an earlier period, which suggests that Skaro’s Daleks had devolved (the Skaro Daleks couldn’t move outside of their city, whilst the Earth Daleks have no such trouble). This might lead us into the murky world of Dalek continuity, so I think it’s best to leave it there. As will be traditional with most Dalek stories, they only pop up right at the end of episode one. It’s an obvious trick – hook the viewer in and then reward them with just a taste, thereby forcing the audience to return next week. So if we don’t have the Daleks here, what do we have? For starters, it’s the series’ first major location shoot and also the first time that the regulars were seen on location. Having spent nine stories confined in the studio it’s a considerable novelty to see Billy and co. out in the open. As with most stories to this point, Nation elects to block the entry to the TARDIS – this time via a collapsing girder – which forces the Doctor and his friends to venture further afield. Given that the raison-d’etre of the series had subtly changed (the Doctor was now becoming more proactive in his desire to combat evil) it probably wasn’t required, but it’s always nice to see old plot favourites (Susan’s sprained ankle is another). It slowly becomes clear that they haven’t returned to Ian and Barbara’s time (notices which state “It is forbidden to dump bodies in the river” are something of a giveaway). The mystery is settled when Ian finds a calendar for 2164 (Doctor Who often liked to set stories exactly a few hundred years in the future). Quite why 2164 looks a lot like 1964 is a mystery that’s never explained on screen (although in Terry Nation’s original drafts it was revealed that the Daleks had invaded in the 1970’s – so any technological or architectural progress would have been drastically curtailed from that point onwards). As we get further into the story, I’m sure we’ll find time to discuss the Daleks’ bizarre reasons for invading Earth, but for now let’s restrict ourselves to the underwater Dalek. Why was it underwater? Apart from providing a decent cliffhanger I can’t think of any other credible reason. But that’s been a good enough reason for many Doctor Who cliffhangers down the ages, so let’s not carp too much. As is well known, Planet of Giants was originally a four part story before producer Verity Lambert, apparently on the orders of the head of serials Donald Wilson, opted to combine the last two episodes (Crisis, The Urge To Live) into one. It’s always slightly amazed me that this happened – for financial reasons, if nothing else. Merging two episodes together effectively meant that the budget for the transmitted Crisis doubled (in today’s terms it’s not a great deal of money, but Doctor Who, like every other BBC series of the time, was closely monitored to ensure that their budgets were adhered to). The reason for the editing was twofold – it was believed that the four-parter was too slow and also that it wasn’t a sufficiently impressive season opener. Whether it’s slower than, say, The Sensorites is open to debate (and just consider if every Doctor Who producer who followed Lambert had been as ruthless – just how many more episodes would we have lost over the years?). The notion that it would make a poor debut serial for Doctor Who‘s second season is a little odd – episode one was transmitted on the 31st of October 1964, whilst the last episode of season one was aired on the 12th of September 1964, a mere six weeks earlier. Since very little time had elapsed between Reign and Planet, most viewers probably wouldn’t have considered Planet to be the start of a new season anyway (back then, it was common for long-running series to take occasional breaks of a few weeks or months – it didn’t always signify that a new production block had started). Douglas Camfield (who had directed the original Crisis, Mervyn Pinfield directed The Urge To Live) was given the task of editing the two episodes together. Overall he does pretty well, although there are a few signs that it’s something of a bodge-job (a handful of sudden fade to blacks, plus the odd scene ends fairly abruptly). Nothing too vital was lost (unless you’re a fan of Hilda and Bert) and there’s no doubt that the transmitted Crisis zips along nicely. But even the more streamlined transmitted episode can’t hide the basic weakness of the story – the Doctor and his friends remain impotent characters, unable to prevent Forester and Smithers from carrying out their plans to introduce DN6 to an unsuspecting world. All their attempts to warn the authorities – using the phone, starting a fire – achieve nothing and it falls to the nosy telephone exchange operator Hilda (Rosemary Johnson) and her police-officer husband Bert (Fred Ferris) to save the day. You have feel a little sorry for Forester – a master criminal he was not. After ringing up Whitehall and pretending to be Farrow by using the classic trick of placing a handkerchief over the receiver (he would have been better off attempting to imitate Farrow’s whistling speech impediment!) he immediately catches the interest of Hilda, who realises that the man on the phone wasn’t Farrow. Clearly, Hilda must spend all her time listening in on calls! It’s also a little bizarre that Forester made no attempt to change his voice when he pretended to be Farrow, obviously he felt that the handkerchief was doing all the work for him. Hugh Greene, director general of the BBC, reported at the BBC’s regular programme review board that he felt Planet of Giants didn’t really work and also that he was looking forward to the return of the Daleks. No doubt his anticipation concerning the the Daleks was shared by most of the viewers at home, so it’s tempting to view Planet of Giants as little more than “filler” – just something to kill time before the next story. That’s a little unfair, as whilst Giants has some narrative problems it’s also a visual treat.